LonADay: Will Twitter Go Mainstream? Seems everyone (well, everyone on Twitter) thinks Twitter will bust out into the mainstream in 2009. I'll go on record as being in the skeptical camp. 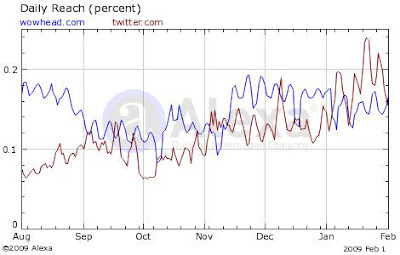 Another factor people point out is the explosive growth of Twitter. Let's put this in perspective. Twitter JUST passed the World of Warcraft fan site, wowhead in January. Popular, but hardly "mainstream." Twitter is a cool infrastructure. I'm personally working on a number of projects built on it. But I don't see it breaking out in its current form. Twitter is organized around individuals, not topics. This allows for the IM-style conversations that go on, but it makes it really hard to find information. Twitter's "killer app" at the moment is link-sharing. I think there's a model focusing on this where they can by very successful. Last I checked, your Grandma wasn't twittering on her smart phone. Unless you're web browsing on your phone (and that's painful on anything besides an iPhone), you don't need the link sharing. Instant Messaging? Plenty of good solutions already. As mentioned in a previous article, I just don't see Twitter's future in its current form.